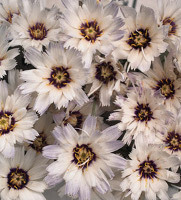 Catananche or Cupids Dart (Love Flower, Blue cupidone, Cerverina) is a hardy herbaceous plant native to southern Europe and a member of the Daisy family, Compositae. The plants make elegant border or bedding plants with grey green foliage and aster like blooms. 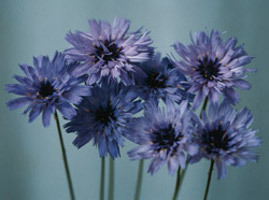 They are easily grown and makes excellent dried flowers. Plants may be propagated either by digging and dividing existing plants in the spring, or by sowing seed. Seeds should be sown in pots, trays or a bed prepared with a soiless seed starting medium (1 part sphagnum peat moss to 1 part sand is fine). Sow the seed and cover lightly. Maintain temperature at about 70F and keep the medium moist, but not soggy. When seedlings reach 2 inches in height, transplant to larger containers or, if outdoor temperatures remain above 55F, you may set the transplants in an outdoor prepared area.